Thinking about replacing a clock mechanism with batteries? Think twice: no batteries, no electricity, just elbow grease to keep track of time. The ultimate green machine. Old clocks are not only remainders of days gone by but fit to keep on ticking for many years to come. Some people can’t stand the tic toc of a clock. Some can’t live without. My brother Jean Latham, otherwise known as L’Heurloger, used to sleep with 17 clocks chiming, ringing, tick-tocking in his bedroom, some on the hour, others on the half hour, a few on the quarters. That’s how passionate he is about clocks. He simply loves fine craftsmanship. 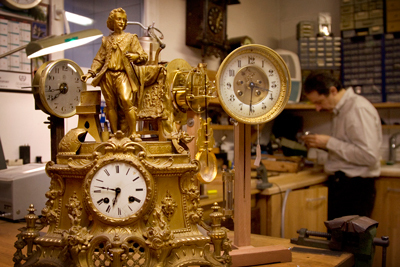 Clock repairers are akin to an endangered species in the digital age and it’s a shame really. Clocks are such beautiful and fascinating mechanics. Clocks used to be the heart and soul of a home, the only noise at night and the morning wind up drill. However, few clocks are in working condition because they are complex mechanisms. That’s what clock repairers are for. So how do you become a clock repairer, an horloger? It helps if, as a teenager, you’re gung ho on mechanics, be they motos, tv sets or clocks. Jean took apart every single thing my parents had. It drove them nuts. Then Jean put things back together with his fairy hands and tada! They were as good as new. That’s how he discovered his calling for old clocks. Tirelessly, he spent hours weighing the pros and cons of a wheel here or a wheel there. He started making missing parts with his own hands. Finally, he entered a clock repairer workshop as an apprentice. His apprenticeship lasted 15 years, first in the 8th arrondissement of Paris, second in Le Marais. Jean now runs the only clock repair shop in Puteaux and one of few in the Hauts de Seine, Paris western suburbs. Puteaux’s local magazine ran an article on him in their April 2008 issue. Located at the back of an alley in Puteaux, Jean is always up for a technical challenge or the simple refreshing of a clock or a mechanical watch. If you ask him, he’ll gladly share his love for “swinging pendulums, springs and wheels”. He always shows me something interesting when I visit. He once showed me a gilded leaning woman clock. The woman sat on the round display underneath which a monster’s head opened its mouth to let out a chain. The chain twisted and turned with the mechanism, creating the illusion of gilded water falling in a wrinkled metal pool below. I’d never seen anything like it before. From automats to bracket clocks, from music boxes to room barometers, from grand-father clocks to carriage clocks, he’s seen his fair share of clocks. He turns the hands of the display and a few seconds later, “gong – cuc-koo, gong-cuc-koo”. Right on. Jean Latham speaks English, so drop him a message here and he’ll take care of you!